Both my grandmother and mother were/are skilled with the sewing machine. This was partially due to economy, but also because you can have anything garment you want, in the color and style you want, if you can make it. There’s also a sense of accomplishment and a special relationship with your clothes when you sew for yourself. 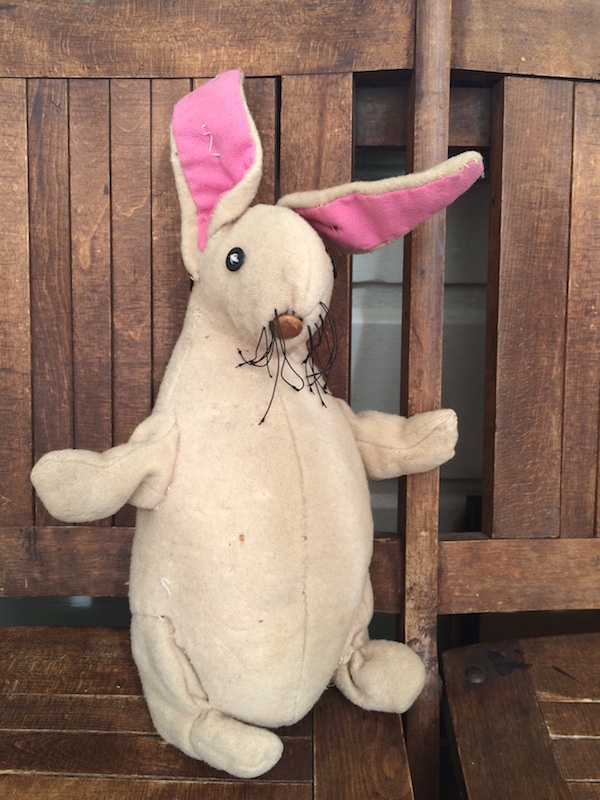 Here’s a rabbit my grandmother made me when I was little. He’s pretty impressive if you study how he was constructed, and look at all that hand stitching! My mother made a lot of our clothes growing up. 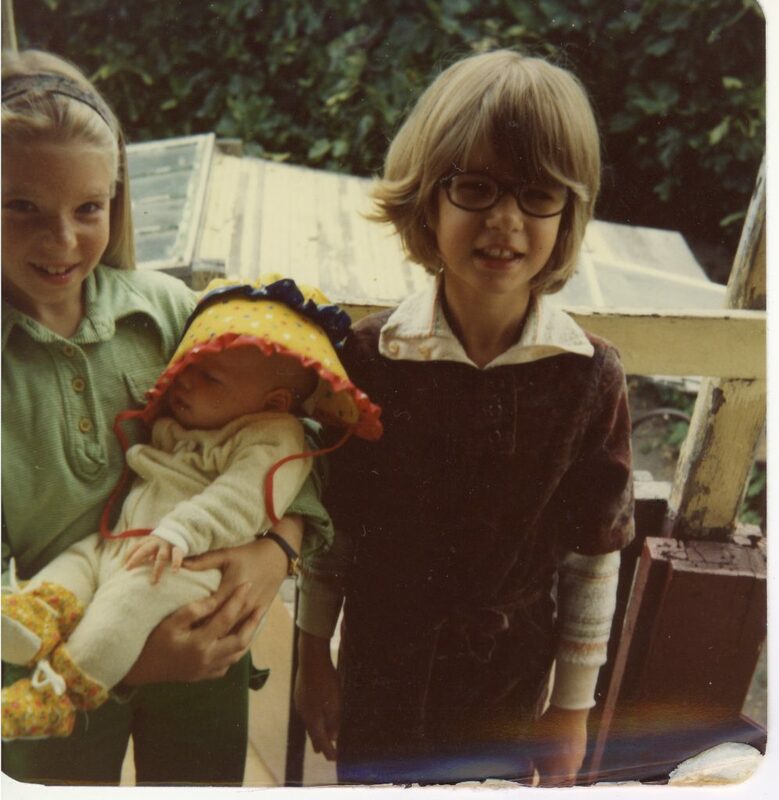 I am the kid on the right in one of the many jumpsuits she made me. 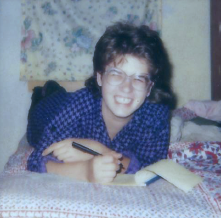 My mom was sensitive to my need to look cool when I was a teen in the 1980’s, and she taught me how to sew during this time. 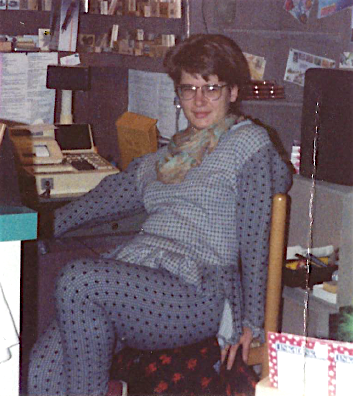 The trendy look was a long button down shirt and stirrup pants; here I am in my beloved purple houndstooth print top which I wore with black and matching purple socks. 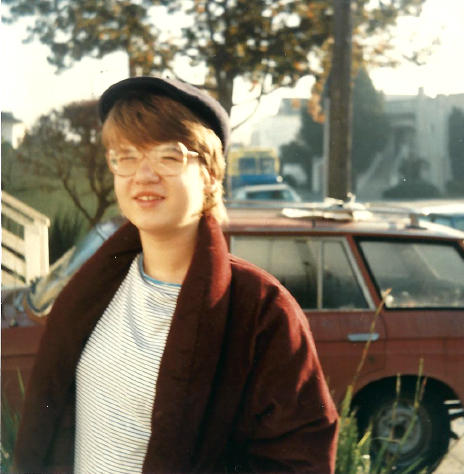 It was a true act of love when she made me this puffy dark red corduroy coat. These were the rage, and it was no small feat sewing one for me. By time I hit college, I was good enough to create my own patterns. We bough a lot of a of fun, reversible knit fabric, which I sewed into this little jester-like outfit. Here I am at my retail job at a rubber stamp store in the early 1990’s. I’ve continued to sew for myself over the years. I’ve made so many dresses for myself I can tell pretty quick if a paper pattern will fit and the general adjustments I will have to make just by looking at it. 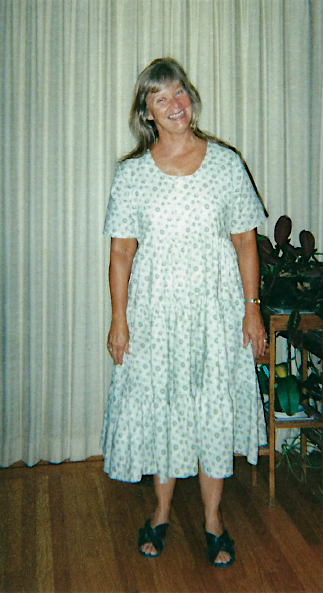 Here’s a light green linen dress that I wore constantly in the early 2000’s. 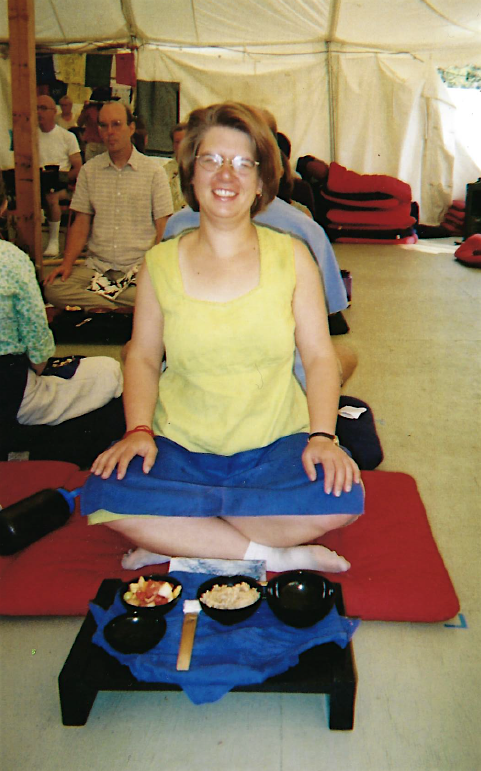 I’m about enjoy a meal following a traditional zen practice known as Orioki at a meditation retreat. I’ve done costumes for the Shotgun Players production of the Jungle Book, and here is a dress that a friend commissioned me to sew for her. I now teach sewing at Black Squirrel in Berkeley to groups and private students. Soon I will post a page exclusively of clothes that I’ve made for myself in recent years.